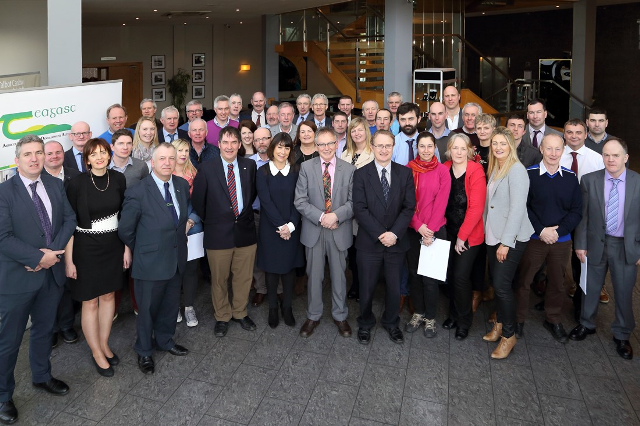 WIT and Teagasc recognised the achievements of Teagasc staff who have completed WIT programmes across the fields of Education, Business and Science at a graduation ceremony held in Carlow earlier this week. This continued professional development (CPD) initiative resulted from a successful tender bid from WIT to deliver a range of programmes to staff working in Technologist and Technician roles in Teagasc over a three period (2015-2018). WIT and Teagasc have also worked together in research, particularly through the Walsh Fellowships which are designed to generate and apply new knowledge for the sustainable development of the agriculture and food processing industry. Addressing the graduates, Professor Willie Donnelly said “The Teagasc partnership is an important part of the WIT strategy for engagement with industry and we are delighted that WIT has been chosen as a partner for Teagasc staff based on our ability to deliver industry focused, flexible, nationally recognised qualifications that are customised to the needs of experienced professionals in a national context. The event was attended by WIT President, Professor Willie Donnelly; Teagasc Director, Professor Gerry Boyle; WIT Head of School of Lifelong Learning and Education, Dr John Wall; Ms Sheila Quinn, Head of Staff Training and Development, Teagasc and Ms Helen Murphy, Head of Department of Education, WIT and Teagasc staff. For information on CPD and part-time courses, visit http://www.wit.ie/solle or contact the School of Lifelong Learning and Education on 051 302040.